application is on 03-11-2017. For more details, see below given information. 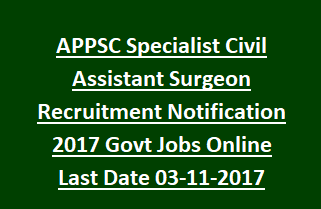 appsc specialist doctor jobs is between 18 to 42 years as on 01-07-2017. Pediatrics, General medicine, General surgeon, Orthopedics, ENT, Pathology. consists of 150 questions. The exam duration is 150 minutes. these posts who belongs to these category.